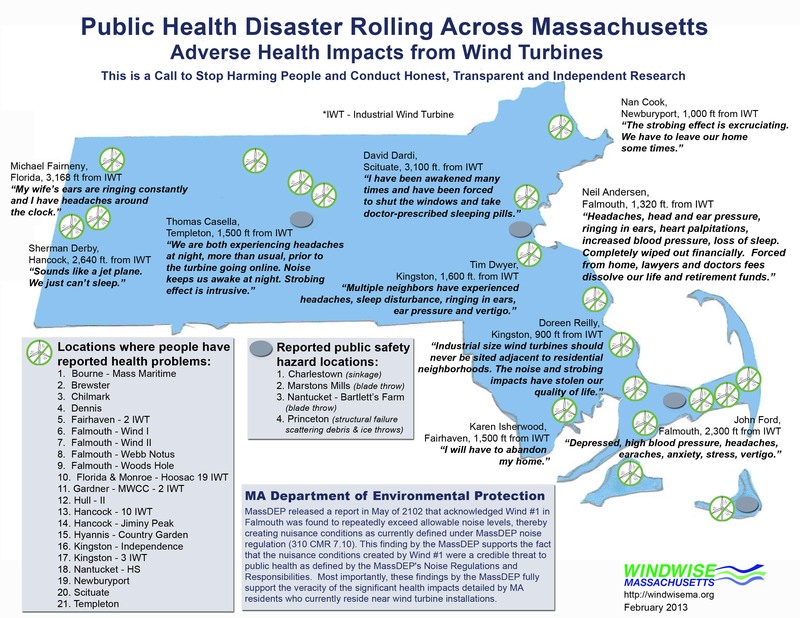 There are at least 21 wind turbine locations in Massachusetts where people living near wind turbines have reported health problems since 2010. The people did not experience the health problems they now report prior to wind turbine construction. When they leave their home, they do not experience the health problems. When they return to their home, they experience the symptoms. They report the symptoms become worse over time. The problem is not going away. The citizens of Massachusetts deserve to be returned to good health. The source of their health problems needs to be addressed and as soon as possible. It is not fair or right to knowingly harm people living in Massachusetts. The foundation of our democracy is that minorities have rights and the health of citizens should be protected. To date no wind turbine has been permanently shut down by any Massachusetts agency. Some Massachusetts agency needs to step in and take action steps to help the people suffering if local boards of health are not protecting and helping people in their cities and towns. …the next logical step is assessment of health problems for people living and working near wind turbines who had originally filed noise complaints. This will help determine what symptoms remain and what next steps are in order to eliminate the health problems. ← New Regs or Policies? Weigh in on Noise! The present DEP policy and regulation may be adequate for limiting increasing noise from ordinary industrial sources, but has proven to be unable to curb incremental community noise creep from the operation of each and every wind turbine. Normal industrial noise generates the same operating noise level lending itself to easy and accurate measurement for compliance by turning the source on and off. Wind turbines generate a different operating noise level making the on/off protocol impossible to accurately measure for compliance. Normal industrial noise sources tend to be isolated in rural communities or clustered together in industrial zones. The increase in ambient noise from one has little to no effect on the other. Wind turbines are spread apart in rural communities such that the each one increases the ambient as well as the impact leading to an ever increasing noise creep with each and every wind turbine. For wind turbines, only a regulation that uses setback distance can protect the public from excessive noise creep. A minimum of a mile and a quarter has been proposed by many who have studies this problem. I have developed a schwanoma in my cochlear. I live less than .5 miles from 2 turbines in Fairhaven. I first noticed changes approximately 1 year ago. I’m wondering if it has developed sort of like a callous would? I’ve attempted to research this but have not yet seen a similar case. So, I was wondering your thoughts on this. Here is one research article that might shed some light on your health issues – perhaps contact with Alec Salt will produce some answers. “alternating infrasonic pressure changes can induce endolymph movements into the endolymphatic sac.” Salt, A 2003. Alec N. Salt, Ph.D., Cochlear Fluids Research Laboratory, Washington University in St. Louis. Sorry to hear about this development, Catherine. We have a contact who can connect you with people who may be able to help with your research on this. If you will kindly send your email address to info@windwisema.org, we will put you in touch.